COLUMBIA, S.C. – The University of South Carolina Athletics Department held its annual Gamecock Gala on Monday evening at the Koger Center in downtown Columbia. 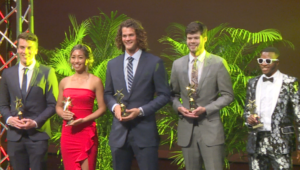 The event honored the University’s student-athletes for their accomplishments during the 2018-19 campaign. Student-athletes, administrators, coaches and special guests attended the elegant event, which featured a red carpet entrance, heavy hors d’oeuvres, awards and video features. SEC Network’s Alyssa Lang, a South Carolina alum, was the featured emcee this year, and she, and several student-athlete emcees began the evening with thank you’s, before a season-long highlight video featuring all of Carolina’s athletic teams, which was followed by a special recognition for University President Dr. Harris Pastides, and his wife, Mrs. Patricia Moore-Pastides, who will be retiring from their post at the University later this summer. 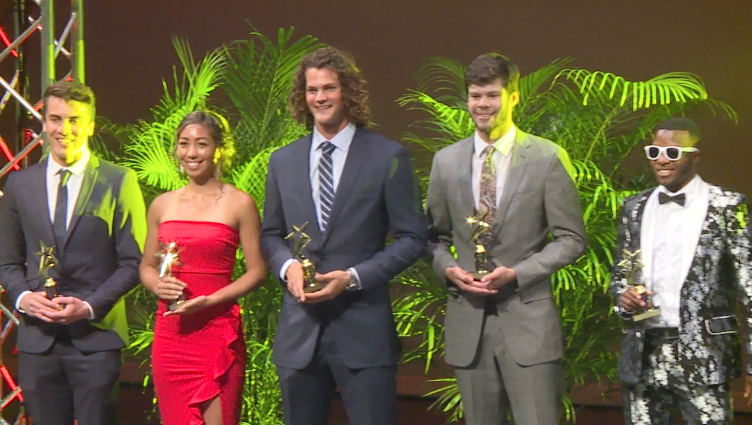 The winner of this year’s President’s Award was decorated beach volleyball standout, Shannon Williams. She is the team’s active career wins leader with 75 during her time in the Garnet and Black. That mark is even more impressive when you consider that 87 of her 128 career starts have been at the No. 1 position in the lineup. She currently has a program-record 43 career victories at number one, more than the second-and third-ranked Gamecocks combined, and is just the second Gamecock all-time to reach 75 career wins. Williams helped lead South Carolina to the eight-team NCAA Championship bracket in each of the last two seasons, and, this season, she and her partner have 16 victories, including highlight wins over No. 2 Southern Cal and No. 18 Georgia State. She holds an outstanding GPA, has earned numerous academic accolades and is also an outstanding example of leadership through her community outreach events and her involvement on SAAC each of the last two years.